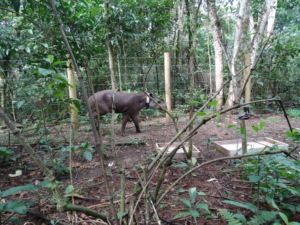 Following the arrival of three Lowland Tapir Tapirus terrestris at REGUA last January, a further two males and a female named Jupiter, Valente and Flora arrived at REGUA in Guapiaçu as part of the continued Tapir reintroduction programme at REGUA on Sunday June 10th. Sadly, we sustained the loss of the large adult male from pneumonia in March so these three new individuals were a most welcome addition to the remaining population, a mother and adolescent tapir who are very well. This reintroduction project has been carried out in partnership with Professor Fernando Fernandez, Maron Galliez and Joanna of the Federal University of Rio de Janeiro (UFRJ) and approved by the Rio de Janeiro State Environmental Department (INEA) as well ICMBio. 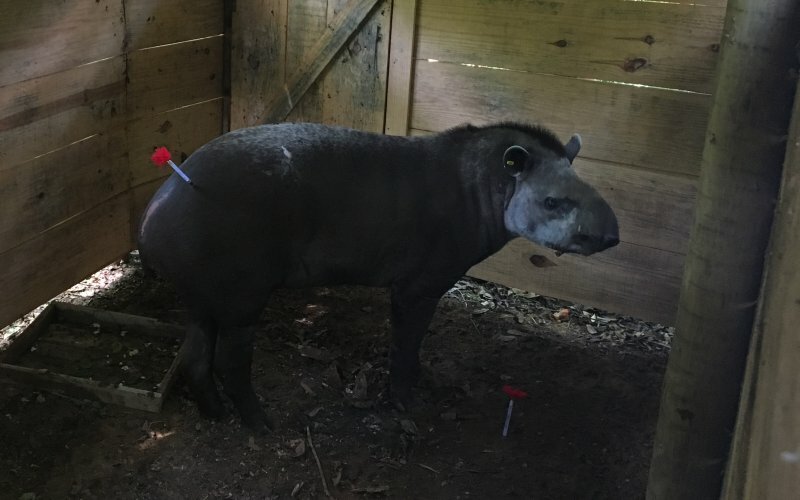 The tapirs arrived after a tiring 24 hour trip of over 1,000 km from the Klabin conservation project in Northern Paraná State. They were transported in their travelling cases but had behaved admirably and arrived quite calm. Following much local interest, the cases were promptly taken to be unloaded and released in their two and a half acre quarantine pen created especially for them within a secluded part of the wetlands. The quarantine area has a small pond in which to play and enjoy. Lowland Tapir has been extinct in the state of Rio de Janeiro for over 100 years and the arrival of these animals at REGUA represents the very first reintroduction of its kind in Rio de Janeiro state. REGUA starting reforesting lowlands in 2005 with the support of the World Land Trust and in 2005 created RPPN status which protects these restored forests for the future. Lowland forest has virtually been eliminated in the State and REGUA’s protected area of 300 hectare Atlantic Rainforest adjacent to the enormous Três Picos State Park looked a very attractive area that could guarantee sufficient habitat for the species. Being herbivores, tapirs consume all the fruit they can find on the forest floor. Feeding on fruit and walking large distances in the forests, they are regarded as the ‘gardeners of the forests’. The UFRJ team understood the need for reintroductions as a means to learn more about this species and their adaptability whilst REGUA wants the animals to spread tree species, increasing forest diversity and ensuring its resilience on the long term. Likewise, captive breeding programmes are only too delighted to support such well conducted release programmes as it provides the justification for breeding these lovely animals in captivity. Until their supported release, and like their predecessors Eva and Flokinho the three tapirs will enjoy a diet of fruit and vegetables, up to 8 kilogram per animal per day together with dried maize, to keep them well nourished. Professors Maron and Joanna will keep their eye on them ensuring that the radio collars are not bothering them and they like their diet. After their release they will find fruit and maize nearby, but like most native animals they will probably prefer to roam and return to the solitary lives they enjoy. Their release will provide valuable information as to their wanderings and habitat preferences, but there are already camera traps in the pen to check on their nocturnal behaviour and later more will be placed in the forest. Exciting times ahead for our tapirs and for our biologists!! You can see Flora’s arrival into the quarantine pen here: Flora’s arrival filmed by Nicholas Locke. The tapirs still haven’t been fully released into the wild but their pen surrounds a large inlet of water and in the heat of the day both adults, baptized Adam and Eve, enjoy staying in the water to savour the coolness. Adam has a radio collar attached but Eve’s collar was removed to let a sore heal. 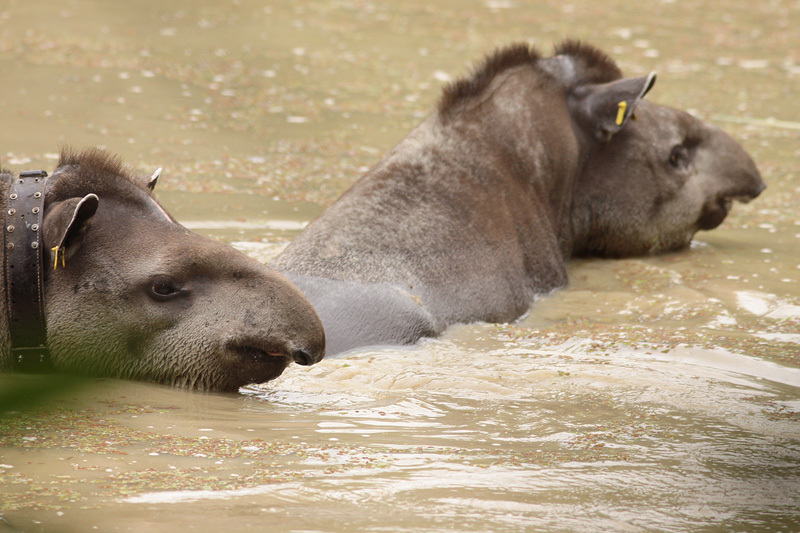 Seeing two tapirs wallowing in the protected and natural habitat at REGUA is quite a sight! We are hoping for a soft release by the end of February – more news to follow! 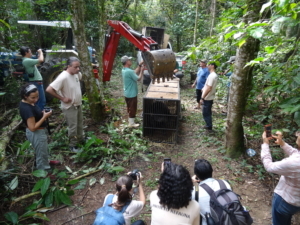 The introduction of the Lowland or Brazilian Tapir Tapirus terrestris at REGUA is going very well. The two adults (previously referred to as Napoleon and Daphne) have been baptized ‘Adam’ and ‘Eve’ by the REGUA Young Rangers and the one year old calf (previously named Frank) has been given a new name, ‘flokinho’ or ‘Snowflake’ – probably because you see him very rarely here in the forest. He regularly wanders in and out of his release pen and ventures around the entire lowland area. The researchers have been doing a great job and attached a radio collar to both adults and the programme is going according to schedule. For those who have never seen a tapir running in the forest, this is an opportunity not to be missed. They run faster than a champion Samoan rugby player with a similar frame and promptly disappear into the forest. There is a great pool in their release pen in which they can wallow and the adults love relaxing. These tapirs are just terrific animals and although we are providing a fruit and vegetable supplement, they much prefer browsing the natural vegetation. They appear to enjoy nocturnal activities and we are set to release them at the end of February if all goes well. Based on their and our learning, more will follow. After five years of planning we are delighted to announce to arrival of three Lowland Tapir Tapirus terrestris at REGUA, a male, female and calf. 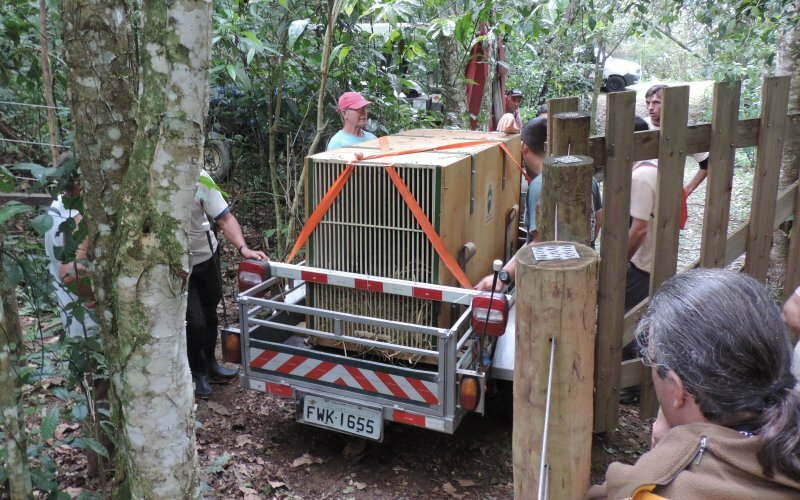 This reintroduction project has been carried out in partnership with Professor Fernando Fernandez of the Federal University of Rio de Janeiro (UFRJ) and his team and Rio de Janeiro State Environmental Department (INEA). 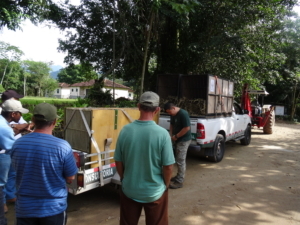 The tapirs arrived yesterday afternoon after a tiring trip of over 1,000 km from the State of Minas Gerais. Their travelling cases were unloaded and taken to a specially prepared pen created in a secluded landscape where the animals can become accustomed to their new environment. For a while we will provide fruit and vegetables for them to eat – up to 8 kg per animal per day. During this stage strict guidelines will be followed to ensure they do not become habituated or reliant on the provision of food. The Lowland Tapir has been extinct in the state of Rio de Janeiro for over 100 years and the arrival of these animals at REGUA represents the very first reintroduction of tapirs in Rio de Janeiro state. Our forests have lost their largest land mammal and one responsible for spreading the seeds of many trees and ensuring the strength and health of a forest – often referred to as the ‘Gardener of the Forest’. 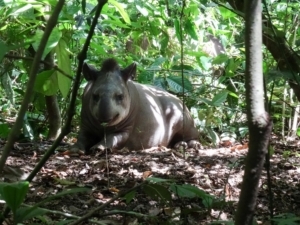 With the return of the tapir, REGUA will have great help in the regeneration process of the forest. Here’s wishing our new tapir family a successful future!